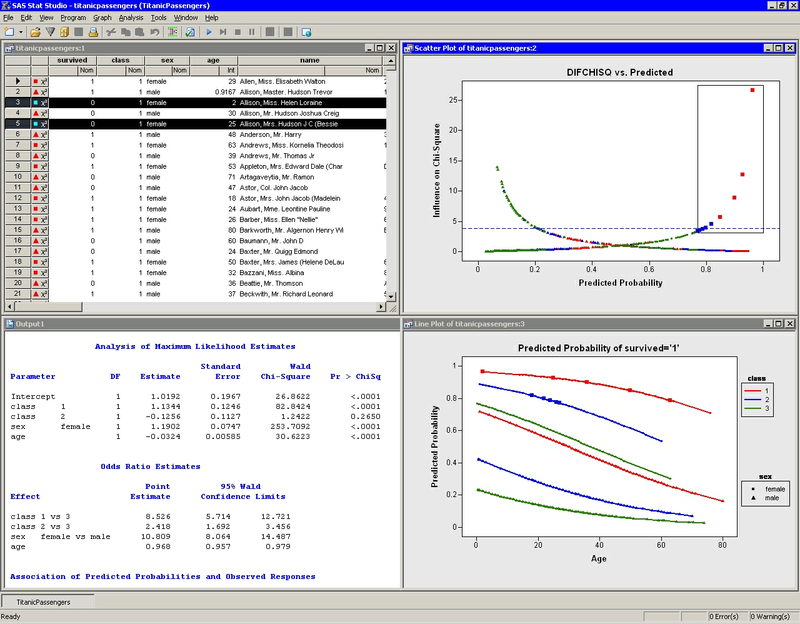 SAS/IML Studio (formerly known as SAS Stat Studio) is a programming environment for statistical computations and graphics. SAS/IML Studio requires that you have a license for Base SAS® , SAS/STAT® , and SAS/IML® software. SAS/IML Studio runs on a PC in the Microsoft Windows operating environment. The programming language in SAS/IML Studio, which is called IMLPlus, is an enhanced version of the SAS/IML programming language. The "Plus" part of the name refers to new features that extend the SAS/IML language, including the ability to create and manipulate statistical graphs, to call SAS procedures, and to call functions in the R programming language. Figure 1.1 shows the SAS/IML Studio interface with a logistic model for the probability that a passenger survived the 1912 Titanic disaster. The figure shows output from the LOGISTIC procedure and three linked views of the data: a data table, a diagnostic plot that uses the DIFCHISQ statistic to identify observations that do not fit the model well, and a line plot that shows the predicted probability of survival as a function of a passenger’s age, gender, and cabin class (first class, second class, or third class). Observations that are selected in the diagnostic plot are shown as selected in all other (graphical and tabular) views of the data. The shapes and colors of observations are also shared among all views of the data. This book does not require previous knowledge of the SAS/IML language. The emphasis in this book is on the "Plus" part of the IMLPlus language.